The Greatcoat by Helen Dunmore is published by Hammer, of Hammer Horror fame, and has been widely discussed in the press as the author's first horror story. But it's really not what I'd call horror. It's eerie, yes, and has a slightly unsettling, dreamlike quality to it, but if anything, what it most closely resembles is those quietly magical time-slip novels of my childhood: Charlotte Sometimes, perhaps, or Tom's Midnight Garden. Isabel, newly married to a young GP in 1952, is struggling to find real purpose in her life as a housewife in a Yorkshire market town, where she has few friends and few outlets for her interests. Shivering one night in the freezing ground-floor flat she and her husband are renting from their dour, bitter landlady, Isabel finds an old RAF greatcoat, left over from the war, tucked away on top of a wardrobe, and huddles beneath it to keep warm. And it's around then that a mysterious young airman begins to knock at her window. 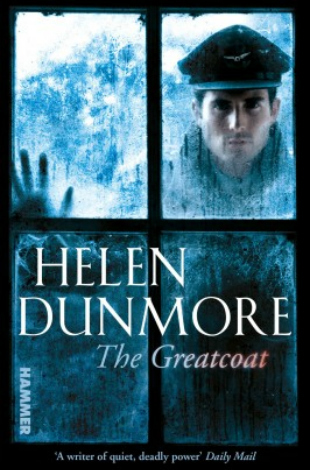 On the face of it, The Greatcoat is a ghost story, but it's really much more than that. Alec isn't really a ghost - he's perfectly real, solid and all too physical, as it turns out - so much as an ordinary man who has somehow slipped, or perhaps been pulled, from his own time into another. If there are hauntings in this book, Alec is not responsible. Isabel finds her mind frighteningly crowded with another woman's memories, squeezing her own identity and relationships from her head as a cuckoo pushes a mother bird's real baby from the nest, almost as if she's being possessed by a spirit. Isabel and Philip's landlady, grey and hollow and forever pacing up and down in the apartment above theirs, is an intrusive, malevolent presence, and even the war itself, leaving behind its disused airfields, rationing, hardships and painful memories of those loved and lost, hovers like a spectre over an austere 1950s Britain. The Greatcoat is beautifully written throughout in perceptive, perfect prose, and almost every character is vividly well-constructed (with the exception, perhaps, of Isabel's husband Philip, although given the plot, this may well be deliberate). I found it incredibly easy to sympathise with Isabel, brought up by an aunt and now trying to master the art of making a steak and kidney pudding and haggling over the best fish at the market when she could have been studying for a degree, and any adult who's ever had that nagging feeling that they still aren't quite a proper grown-up yet will understand how she feels. There are times when Isabel fears that she's losing her grip on reality, unsure whether Alec is what she believes him to be, or even if she's what she believes herself to be, but in a way, this simply mirrors the unease she feels over her new role in life as a supportive housewife. If you're looking for real scares, The Greatcoat probably isn't for you, and if I had to look for something to criticise, there were perhaps moments when I felt that Isabel's attraction to Alec was slightly over-romanticised. But this a tiny point that I've had to struggle to think of. Overall, it really is a thoroughly absorbing, exquisitely-crafted, thought-provoking book that will stay with you long after you've finished the final page.